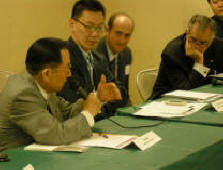 The Chinatown Working Group (CWG) was formed in October 2008 as a community-based planning initiative on the future of Chinatown in New York City. The goal was to support the community’s residents, workers, businesses and visitors. Chinatown Working Group members include Chinatown’s stakeholders – representatives of community groups, Community Boards #1, 2 & 3 and interested parties. The effort focused issues of shared concern throughout Chinatown including but not limited to affordability, preservation, revitalization and the social and economic well being of families, seniors and youths. The Chinatown Working Group's objective was to articulate common goals for Chinatown’s future with consideration for its impact on adjacent New York City communities, and to formulate and work with New York City agencies to implement a precise, comprehensive, meaningful, timely and broadly supported community-based plan. You can see a full list of participating members and organizations here. The last meeting represented in the contents of this website was on Monday, June 22, 2015. Full details and RFP: Can be found on the University Settlement Site. (clarification language); and page 112 (correction under proposed zoning for Subdistrict E2). On Wednesday, June 18, 2014 The Pratt Center and Collective for Community Development presented a summary of the recommendations to be presented for review and outreach to the community to build public support. 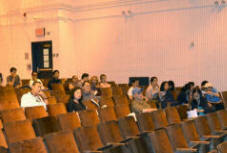 The public forum was announced on this site and through flyers in Chinese, Spanish and English. The presentation was made in Chinese, Spanish and English. Here is the presentation. And here is an English version of a brochure summarizing the zoning recommendations as of June 26, 2012.
other city agencies on zoning recommendations. for public review process (ULURP). Photographer: Zella Jones On May 19, 2010 the Chinatown Working Group met at the request of Secretary Ray LaHood of the US Dept of Transportation as part of the White House Initiative on Asian Americans and Pacific Islanders (AAPIs). Read here about the CWG initiatives presented. Read here about the White House initiative. 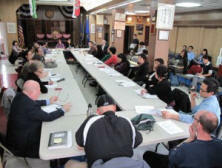 The Second Town Hall Meeting on February 1st, 2010 was conducted in Cantonese, Mandarin, Fukienese, Spanish and English Charrettes and provided valuable feedback for the Chinatown Working Group's Preliminary 197a Action Plan. The Chinatown Working Group's plan is to create an inventory of existing conditions and identify realistic implementation of strategies that address, among many issues: truly affordable housing, multi-cultural and historic preservation, economic revitalization and sustainability, commercial stability, residential and business displacement, small/light manufacturing use, open space, public infrastructure, transportation, congestion, tenant rights, the environment including air quality, education, the arts, human rights, immigrant needs, social conflicts and crime, the well being of families, seniors and youths, and zoning. Although zoning is a powerful planning tool that can be used to mitigate the potential negative impacts of development in a neighborhood, it is not the only strategy that should be applied in Chinatown. A broader community-based planning strategy that goes beyond zoning may be pursued. The Chinatown Working Group's community-based plan for Chinatown will engage in a democratic, comprehensive and transparent process in building consensus among diverse groups. 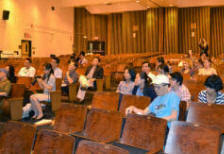 CWG will conduct extensive public outreach to involve as many of Chinatown’s stakeholders as possible. CWG meetings will be held regularly and open to everyone. CWG hopes to have the full cooperation and support of the City for this community-based initiative including access to staff from various agencies, such as City Planning, HPD, Small Business Services, Department of Transportation and Economic Development Corporation. 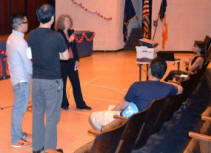 The Chinatown Working Group (CWG) is a democratic and transparent initiative. Meetings are open to everyone. The full Working Group regularly meets the first Monday of each month. Check listings in the right column for updates. The Working Group Coordinating Committee regularly meets the third Tuesday of each month, 4-5:30p, Check listings in the right column for updates. CB 3 is engaging with City Planning as the next step in our efforts to achieve the plan for Chinatown based on the CWG proposal. We hope that you can attend to ensure all viewpoints are represented as we see the plan through. Please pass on this invite to all you think may be interested.